Temperatures are set to hit high numbers these days so to keep the house cool I've tried not to spend too much time behind the stove or use the oven too much. My go-to meal in this situation is fast, casual eating that requires minimal preparation and almost no cooking. My solution this weekend is to make summer salad wraps. I used ripe peaches, baby spinach, goat cheese, cranberries and balsamic vinegar. 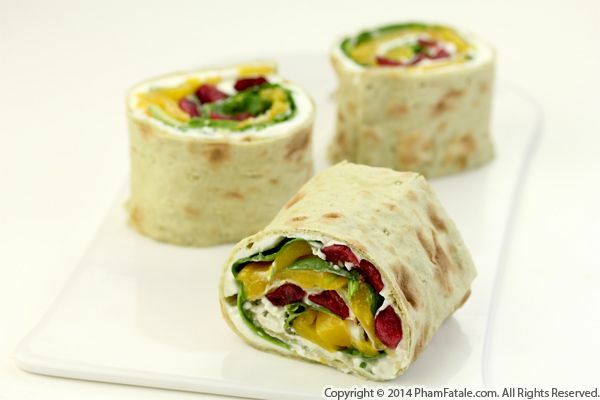 The wraps are tied together with lavash flatbread. The contrast of colors is strikingly beautiful. And can you guess when this healthy and tasty recipe was born? Last year, while working with the creative California Lavash team. You can find this exact same photo on one of their new, colorful packages. These charming finger sandwiches were probably the only thing I could have prepared in the tiny kitchen of the Roman apartment we rented while in the capital city of Italy last week. But it didn't stop me for preparing yummy sandwiches for Aria and me, using local products such as ricotta pannarella and black Angus bresaola meat. Bresaola is salted lean and succulent beef that is air-dried until the meat turns dark red. It originated from the Lombardy region in Northern Italy. And I first discovered out-of-this-world ricotta pannarella while ordering a cheese platter in a restaurant in Rome. We asked the waiter to give us his best selection and I have to admit it sure was! Now I'm just hoping I'll be able to find some back in the US! 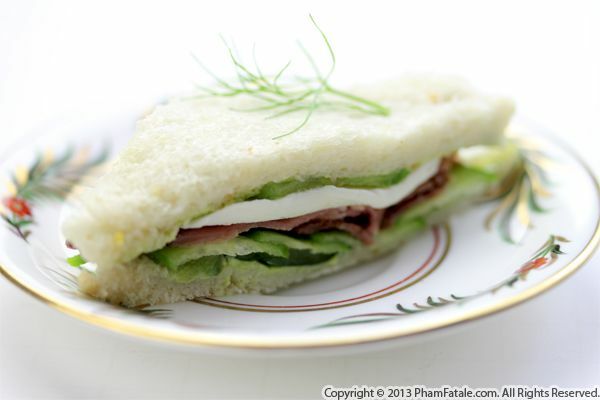 I prepared the finger sandwiches with crust-free, sliced white bread, a mixture of caramelized fennel and ricotta, sliced cucumbers and of course, freshly-made mozzarella cheese and delicious bresaola meat. 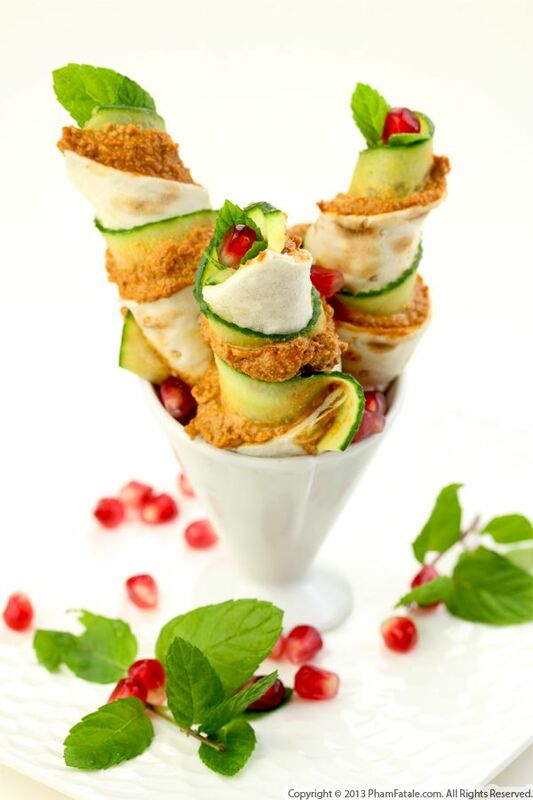 I created these irresistible appetizers for the California Lavash team a while back. It was their idea to combine muhammara (walnuts, charred red bell pepper, fresh pomegranate seeds and mint flavored spread), cucumber, dill, mint and cilantro in their fabulous, healthful lavash flatbread. 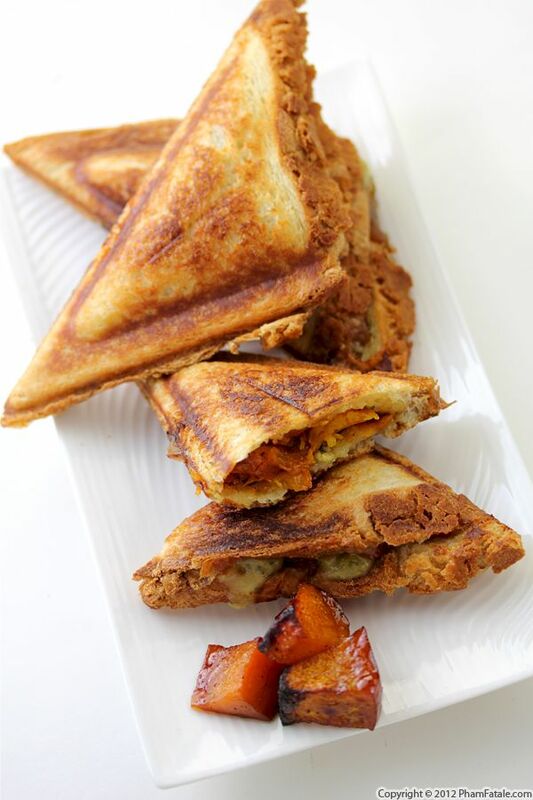 Being the ultimate hostess, in my opinion, requires the art of not only making delicious food but also creating enticing and delectable bites to make sure you please all your guests. I formed twirling portions, which is ideal if you're serving a small number of people. If you're hosting a large party, I would suggest rolling regular pinwheels to save time. I think this type of food is especially appealing to female guests. The colors are striking, almost bewitching. The appetizers have a lot of flavor, yet are super healthy. If you're looking for store-bought muhammara, I highly recommend Haig's. But if you don't want to be too adventurous, you can replace the pomegranate spread with others such as crumbled feta and chopped olives mixed with Greek yogurt and lemon juice and substitute a touch of oregano for the mint. If you’re intimidated by the thought of making sushi, this recipe is a great place to start. 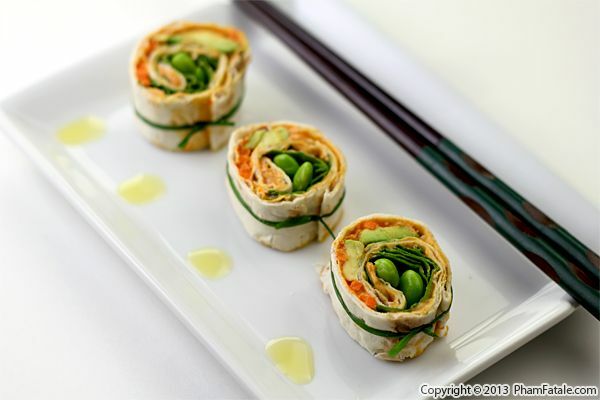 These sushi-syle pinwheelsl are much easier than the real thing, but still delicious. No nori sheets or rice are involved. Instead, I used soft flatbread, roasted red bell pepper hummus, crunchy shredded carrots, wasabi-flavored avocado, edamame beans and spinach leaves. They can be served as appetizers for a dinner party; to ensure they don't fall apart, secure them by tying cute bows around the "sushi" using garlic chives. Remember, you eat with your eyes first! If you happened to stop by the Gilroy Garlic festival this weekend, you may have come across the California Lavash booth. I absolutely love their artisan flatbread and used it in this dish. Their new look has officially launched and it should be hitting Whole Foods shelves in a few weeks; I’m personally excited about that because you'll be able to see my photos on the new packages! My husband's youngest sister, who just started third grade, recently told me she didn't like "Wednesday Pizza" at school and asked me to give her a boxed lunch instead. I had leftover roasted butternut squash, so in the morning, I quickly improvised a flavorful hot pocket sandwich with 2 of my little munchkin's other favorite ingredients: salami and brie cheese. I assembled the pocket in a sandwich grill we have. I love this sandwich maker because it browns the bread and seals the sandwich perfectly. After they were done cooking, I wrapped the sandwiches in wax paper and packed them in her Disney Princess school lunch bag. The sandwiches cooled down to room temperature by lunch time, but they were still crunchy and delicious. If you were to make these as a box lunch for work, you could put them in the toaster to re-heat before eating. No microwave though!